There is no set format, but the meeting will usually start with a time of praise and worship - including contemporary praise songs. There may be readings of short extracts of Scripture, followed by a time of silent meditation. We usually pray for Spiritual Renewal and a fresh infilling of the gifts of the Holy Spirit (more details here); and we always set aside time to pray for the needs of those present, their families and friends, the Parish, other issues of concern, and healing ministry. Over the years, the group has arranged several "Life in the Spirit" Seminars for spiritual renewal as well as Alpha courses,"CaFE" (Catholic Faith Exploration) courses, and other training courses and Prayer Services for the Parish. Catholic Charismatic Renewal in the British Isles. With numerous resources and articles, and links to the Good News Magazine. Cor et Lumen Christi is a Catholic charismatic community in Chertsey who run regular training courses and conferences in Catholic spiritual development. The Catholic Bible School near Chichester runs regular training days and courses in Catholic spiritual development, as well as monthly healing prayer meetings. Alton Day of Renewal meets at Alton Convent, Anstey Lane, Alton on the 4th Saturday of the month for a full or half day of spiritual refreshment and fellowship including Rosary, Communion, Adoration, praise and worship, guest speaker and prayer ministry. Details of 2018 programme here. 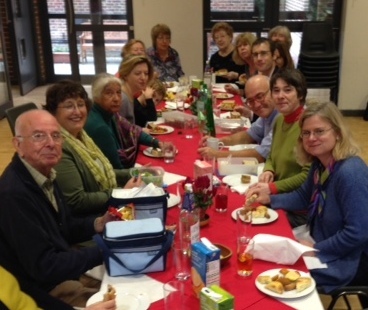 The Group was started at St Joan's Catholic Church around 1980 and has met continuously ever since. We have no formal "membership" but are open to anyone (Catholic or otherwise) who needs prayer support or who wishes to develop their prayer life and spirituality. Prayer Meetings are on Wednesday evenings 8.00-9.15pm in the main room of the Parish Centre with the exception of the First Wednesday each month when we usually meet in the Church for an Evening of Renewal: either Praise and Worship; Healing service; or Holy Hour. "Charismatic and Healing prayer" - text of talk given at St Joan's prayer retreat 2017. Why "Life in the Spirit"? We are named after the Life in the Spirit Seminars, the foundation course in learning about how to experience the power of God working in our lives. ​​Pope Francis is keen to encourage Catholics to develop a deeper appreciation of the work of the Holy Spirit. “Listen to the Holy Spirit because he is giving people the good news that God loves them and can renew, purify and transform their lives.” – Pope Francis, 8th May 2013. Alpha is a journey exploring the Christian faith from the basics. It is for everyone – all ages, all backgrounds. It is equally inspiring for introducing people to the faith or re-igniting the faith of long-term church members.